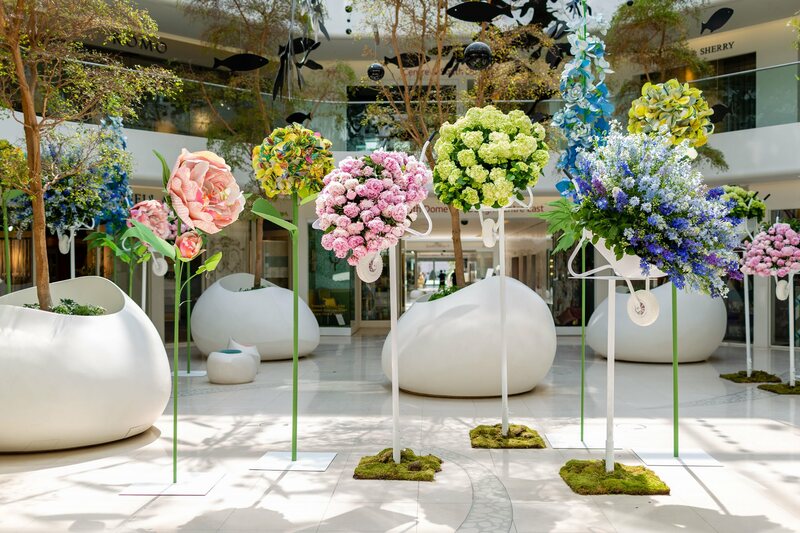 Flowers in all their abundant glory are a sight to behold and to celebrate the current floral design revival in interiors, Design Centre, Chelsea Harbour commissioned a number of installations and experiences. Visitors were amazed by giant architectural forms of flowers that have bloomed into a playful display of pretty colours. 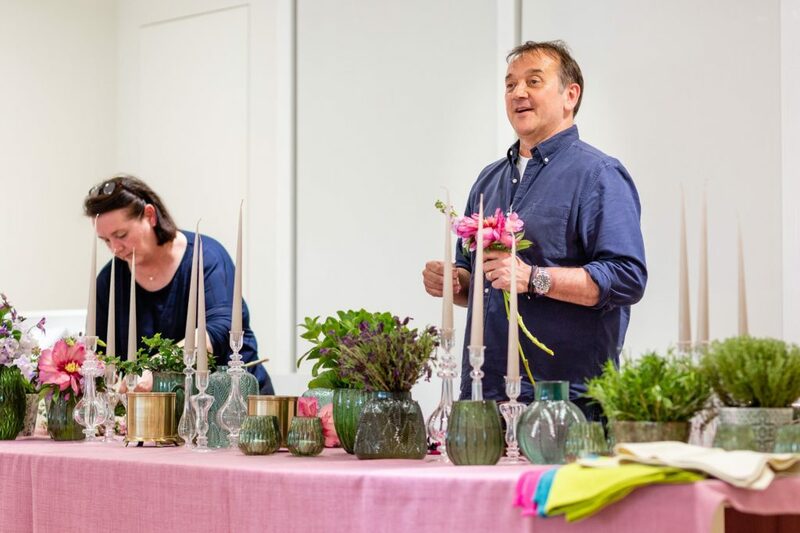 Up to 3.5m tall, the bespoke 3D blue delphiniums, pink peonies and green hydrangeas were handmade from wallcoverings sourced from the showrooms. 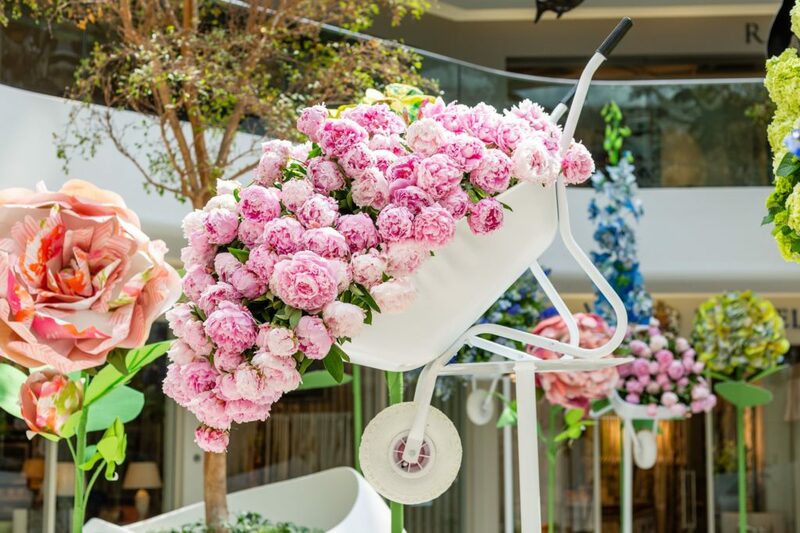 Deliberately over-scaled to tower over visitors, the creative scheme was echoed by the real flowers planted in wheelbarrows by Rob Van Helden, one of London’s top florists. A vision of beauty and natural vitality, they were suspended on poles for dramatic effect. See for yourself on the Ground Floor, North Dome. From fabrics to wallpapers, lighting to rugs and outdoor furniture, florals and botanical references create a contemporary design statement for homes. 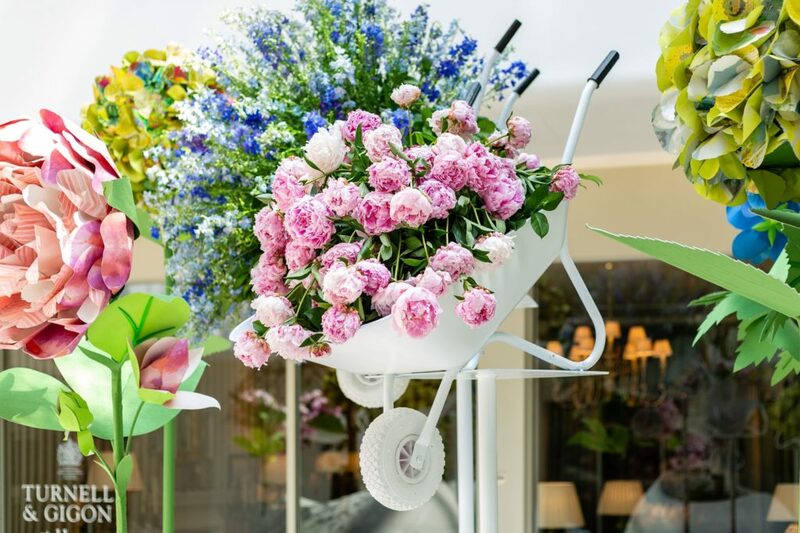 Throughout The Big Bloom, showrooms have been encouraged to bring their designs to life with imaginative window displays based on a floral theme. A competition for the best window display was judged by Kerryn Harper-Cuss, editor of The English Home who selected Altfield as the winner. She liked how they had ‘blended unusual flower varieties and the juxtaposition of quintessentially English snapdragons with tropical hothouse flowers against a backdrop of colourful leathers’. She also noted the sculptural shapes of the flowers arrangements in the window. Follow #BigBloomAtDCCH to see all the entries. Floral prints and patterns embody this season’s playful, layered approach to decoration that is in the ascent. 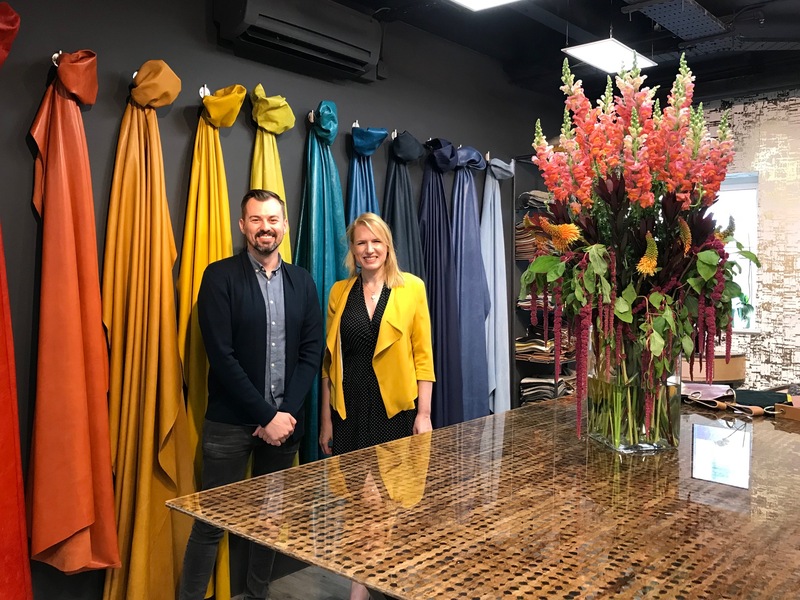 On Tuesday 22 May a special discovery tour took visitors to the heart of the showrooms for a behind-the-scenes look into why imaginative designs inspired by nature are perennially in favour. 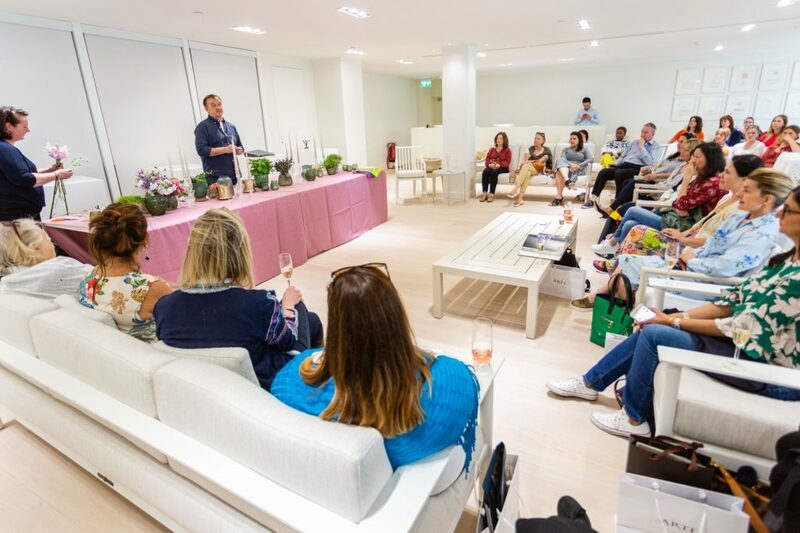 Renowned florist Rob Van Helden hosted a special floral demonstration on Tuesday 22 May. He has worked for clients including Sir Elton John and Pierce Brosnan, as well as royal weddings, film premieres and charity events. Visitors were able to learn his style secrets that mix colour, texture and scale to breathtaking effect and be inspired by how flowers combine in nature.